Installed the 1TB drive that came with it, followed the directions… antenna, ethernet, power. Went upstairs and connected to it. It formatted the hard drive and downloaded guide data. Initial test was done on the bedroom TV using a Roku Streaming Stick+ on 5GHz wireless. About 8 to 9 seconds to change channels if the channel was not previously tuned. About 4 seconds to go back to a channel that was tuned previously. I’ll get to play with this more later on the living room TV which has a Roku Ultra connected via ethernet. It’s extremely windy here today. 40 to 50mph gusts. So trees are moving and my antenna shakes in the wind when the gusts are high. I purposely tuned to a weak PBS station and compared how the Tablo handled it with how the TV handled it. Both were pixelating at times and occasionally it got so bad the sound would drop, but both stayed locked on the signal and nobody freaked out. I do have a question though. When I tune a live channel by selecting the channel (not the show that’s airing) and then go back and select a different live channel, it looks like previously tuned channel flash their channel numbers in red. Is that just an indication that a tuner has tuned those channels? So far so good. I’ll post more after I’ve explored a bit and after I’ve been able to spend more time using it. Got mine today. The WIFI range is HORRIBLE. I have to connect it to my extender which I dont want to do. My old Tablo Dual worked like a dream in the same exact spot. Also: You still dont list the WIFI Mac address on the box or unit. Come on, its been years. Is your router Wireless AC? Wireless AC 5 GHz range is usually way better than Wireless N 5 GHz. Isn’t the new tablo MiMo. If you are using 2,4 could you be suffering from 20/40 coexistence. Or the need to have the router assign WiFI to less busy channels. So far, the Tablo experience is passing the wife test. Watching live tv. During a commercial break we went through setting up Chicago Med, PD, and Fire to record. And Whiskey Cavalier. She said it was very intuitive (she’s used to this stuff on the TiVos) and seemed easier than the TiVos to accomplish the same thing (series recording). Lots more to explore, but right now we’re just watching tv … looks good. Works well. Maybe not having a lot to say says a lot. The Tablo is the only thing suffering though it seems. Every other device in my house works perfectly (including the old Tablo). We’d be happy to take a look, don’t hesitate to send us a ticket. If we set up a remote session, we could try and compare the Wi-Fi the two units are receiving to see what’s going on. 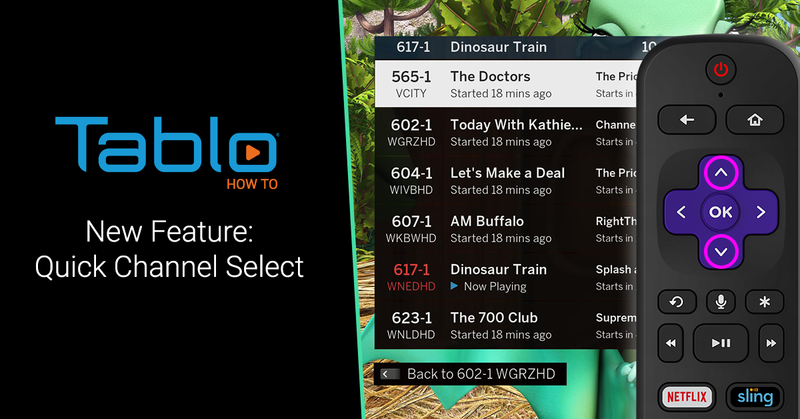 Being a “brand new to Tablo” user, I don’t have any prior experience to base my experience on, but woukd have to say for the most part it is beyond expectations. My only gripe so far is that I wish there was a Tablo Preview equivalent Android app. The Tablo Preview app on my 4K Fire TVs runs quick, full 1080 10mbps with surround sound with no buffering issues. Trying to run the regular Tablo app on my Pixel XL or Chromebook (even on the Fire TVs) I have to turn off Surround Sound and knock it down to 720 5mbps streams to ensure no buffering. I’m guessing the Preview app has better APIs and can use my Gigabit bandwidth better than the original app.